The Nokia Illuvial collection has silently received a new member ??? the Nokia C5-03. On the inside, the phone hasnt changed but it has new makeup on the outside, with pink decals on the back and a matching wallpaper image on the front. Previous members of the Illuvial Pink line include the Nokia 6303, 6303i, 6700 and the 5530. They came with custom leather pouches and straps in addition to their prettified exterior but that doesnt seem to be the case with the Nokia C5-03, which just lists the Illuvial Pink edition simply as a color option. 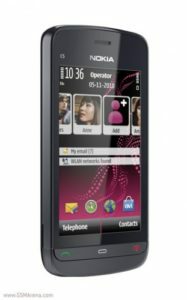 Nokia is yet to officially announce the release date and price of Nokia C5-03 Illuvial pink. Earlier, Nokia launched these Illuvial collection in selected countries only. 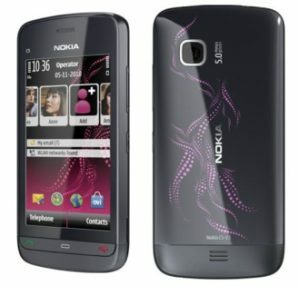 The price and availability of Nokia C5-03 in the Indian market are not yet available. Stay tuned for more updates. » Talktime : Up to 11.5 hours for GSM use and 4.5 hours using 3G.